Need improved GXP2200EXT with color display! The GXV3370 is a beast. The only problem is the firmware is still beta. However it does run Android 7, at least. Any news on GXP2136? Maybe @grandstream? Grandstream- could you comment on this please? The monochrome extension modules are difficult to read, especially next to the nice color displays of my 2170s… I would be really happy if I could by a number of color extension modules. Any thoughts? That is something that would sell like hotcakes. GXP2166 will have higher price, there is now way they add LCD screen for free. Please consider making the combined telephone + expansion panel wall mount. Because the connecting bridge you provide with the panel, has too much flex in it when the panel is mounted to the wall. Here are some photos of our improvised mount - we’ve glued two phone mounts together- one of which was modified to clear the connecting bridge etc. I would like to see something that more rigidly dove-tails onto the body of the phone. The threaded brass inserts lead me to believe the engineers tried to make it more rigid, but it still has way too much flex. It should very tightly connect to the body of the phone, or the feel is compromised. A dovetail type joint provides the rigidity. The visual design of the expansion panel seems to match the old phones not the new ones. I’d like to see a flush glossy front like on the display of the GXP2170. The low-resolution LCD makes the characters a bit ugly and the text hard to read. I’d like to see larger text and in a higher resolution. Add mounting holes for the US standard vertical-orientation phone outlet. I should have copyrighted it. You think they’d send me one free, at least ? I hope they are not going to repeat the glary shiny plastic in front of the screen again, how many times do we have to tell these people that the new look is terrible in some office environments. Looks good for the marketing and terrible when you use it. I would call Luke Skywalker, then Darth Vader, then Taylor Swift. @SFX_Group : the GXP2136 above, is that an actual picture, or just a Photoshop job like mine ? The GXP2136 i posted was an actual picture from Grandstream. Anything you post on this forum you release copyright to (unless you had copyright in the orginal image and made it clear you owned it), however the forum rules still make it clear you likely shouldnt post it here as a law battle will start if you want to enforce your copyright placeholder. What can we do to make them remove that ultra-glare cover ? Ive updated that ticket asking for an ETA as it was a client who told me about this… ! in my opinion, GXP2135 is a nice phone, but the GXP2136 horrible, it looks like a badly clone. The concept shown for the BLF key arrangement (GXP2136) has been around for sometime with a different manufacturer. It is not a new idea and wasn’t 24 months ago either. The same manufacturer has also taken the concept a little further and allows you to program the color of the icon inside the BLF display. In this manner you can use the color to identify groups of people that belong to given departments or functions and you can also customize the color in addition to the standard -blue, green, yellow, red and purple. They are also releasing a new phone shortly that takes the same BLF/DSS function and expanding it such that it becomes an integrated expansion board within the physical phone body. The phone’s main display will accommodate 10 keys and 96 more on the integrated board for a total of 106. Of course, the Yealink board is not really an upgrade per se, but rather a new entry whose compatibility is limited to their recently introduced T5 series of phones (top of the line). They did nothing with the EXP40 or EXP20 which fits their previous base of phones. However, I tend to agree that the phone models are starting to lag behind their peers. However, that may be because the focus has been more so on the door systems, routers, wi-fi AP, HTs and cordless phone models of late. The GXP2170, the newest phone in the line-up, was released in late 2015, not an excuse, simply an observation. Had an answer in a ticket, Grandstream ARE renewing / updating the GXP2200EXT, i would assume the new one fits the GXP21xx series phones. I tried to get an ETA and was told to check the website every few weeks from this point forward. So i would “hope” we could be looking at 8-12 weeks for a new GXP2200EXT type board, lets hope its as flexible as the current one with regards cascading and expansion. I like the 2135 / 2170, although it doesnt have a webcam, i think it works (and looks) real nice… A webcam addition in the same design layout would be nice “option” i think without having to move to an Android based unit. @lpneblett I am aware of the Fanvil X4 product, when I did the artwork almost 2 years ago for a Grandstream concept I had it in mind but I preferred having buttons on both sides of the screen, so basically replacing the GXP2130 paper label with a screen. Good call on the 2nd display being a 2.8" instead of a 3.5" though. In my original design I assumed that they would be re-using the same screen as the main one. Trying one more time : get rid of this stupid glare-enhancing plastic. Just look at the picture that Alex.K posted above : in certain lighting conditions, the screen is unreadable. We just bought 280 phones; that may not be a lot for Grandstream but there are times when they should be listening from end users. 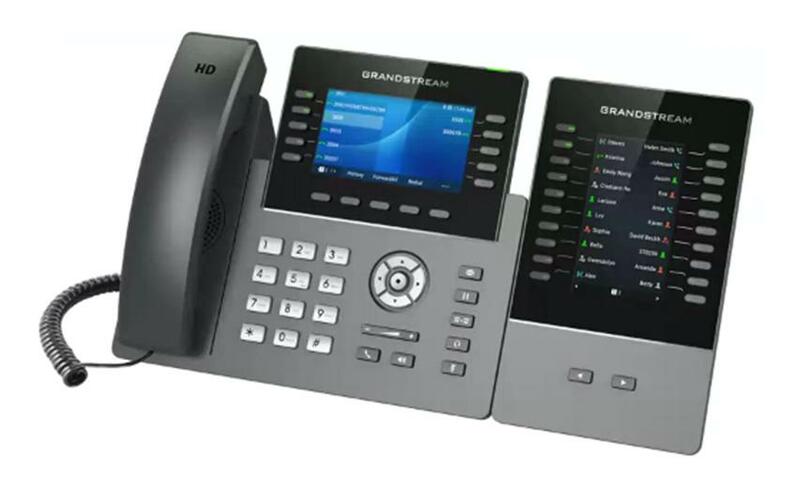 I am not so sure Grandstream are replacing the GXP2200EXT, the new like GRP2615 has a side bar that looks like the Yealink one… but its not the same design as the GXP2170 so wont fit. I was told they are not compatible. I also suggested that they make the expansion module compatible across the new phone line. Do you agree?